This Fiji accommodation is a popular choice for couples and families looking for a resort style experience at an affordable price. Bedarra Beach Inn is set on the beachfront along the famous Coral Coast offering stunning views with comfortable and spacious rooms. Facilities at Bedarra Beach Inn include a swimming pool, restaurant & bar, day spa plus WiFi internet. Sit back and relax on the beach with the coconut trees swaying from the cool sea breeze or explore the surrounding region of Sigatoka. 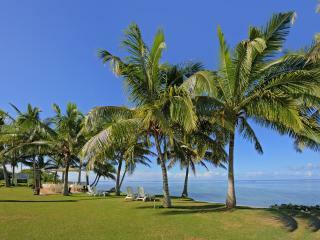 This Fiji accommodation offers a secluded and tranquil location just 2 hours drive along the Coral Coast. Crusoe's Resort is based on 10 acres that fronts onto a stunning white sandy beach, take a dip in the Pacific Ocean where you can snorkel and enjoy amazing dive locations not far from the resort. With only 28 bures available the resort has an intimate feel, perfect for relaxing and just enjoying the natural surrounds. Couples and families will feel right at home with a range of facilities available including a swimming pool, restaurant, pool bar, games room plus much more. Located on picturesque Coral Coast beachfront, DoubleTree Resort by Hilton Fiji - Sonaisali Island offers 120 spacious and luxurious rooms and bures designed to suit all travellers, including both couples and families. Boasting private balconies, HD Smart TVs and WiFi access, the DoubleTree Resort offers guests a pleasurable and relaxing stay. The resort also enjoys an excellent range of onsite facilities including an infinity lagoon pool, a number of bars and restaurants, day spa, kids club and much more. 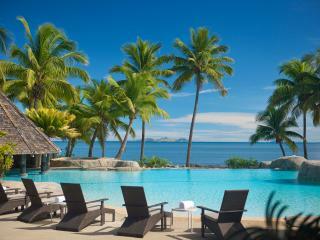 At DoubleTree Resort by Hilton Fiji - Sonaisali Island you can do as much or as little as you like. Hidden away on the spectacular Coral Coast is Fiji Hideaway Resort & Spa - a place as friendly as the Fijian people, with a beach as wide as their smile. 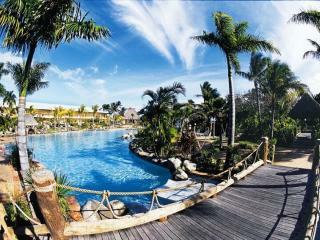 A resort where guests can relax or take part in many of the activities on offer. Fiji Hideaway Resort & Spa offers contemporary design blended with traditional Fijian craftsmanship to provide guests with a unique setting for rest and relaxation. The Fiji Marriott Resort Momi Bay is a 5 star waterfront resort located just 45 minutes from Nadi on the western coast of Viti Levu. With a stunning lagoon, unique overwater bure villas and world class facilities, this Fiji resort is 5 star accommodation at its best! Guests can choose from rooms and bure villas that feature views over the pool, lagoon or ocean, and facilities that include tennis courts, a day spa, restaurants, bars, kids club and fitness centre. The InterContinental Fiji Golf Resort and Spa is located on the picturesque Natadola Beach on Fiji's Coral Coast and offers a palm fringed white sand beach perfect for swimming and snorkelling. This Fiji accommodation offers superior facilities such as an 18 hole championship golf course, kids club, 3 swimming pools, a number of restaurants and bars and a luxurious day spa. The spacious and luxurious guest rooms and suites offer a range of magnificent views from the lush tropical gardens to the lagoon and Natadola Bay. A lovely boutique style adults only resort, Natadola is only 40 minutes from Nadi, situated on one of the most beautiful white beaches in Viti Levu. 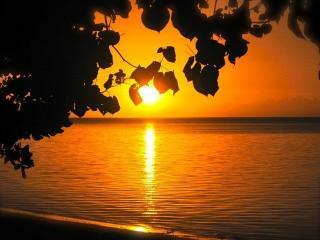 Natadola offers peace and privacy and is great for couples and honeymooners. The private courtyards and garden landscaping create a very relaxed club atmosphere. The emphasis at Natadola is on swimming, fishing, and relaxation, interspersed with beautiful cuisine. This beachfront resort has 214 fully air-conditioned hotel rooms, suites and villas, all with private balconies or patios overlooking the ocean or the resorts lush tropical gardens and surrounding tropical hills. 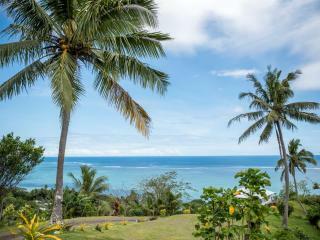 Naviti Resort is located on the Coral Coast halfway between Nadi and Suva and boasts a wide range of resort facilities, dining options and recreational activities. 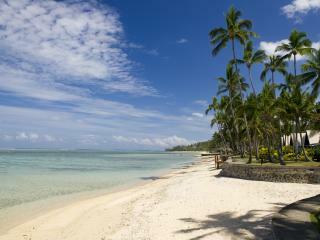 This popular Fiji Resort is also renowned for their all-inclusive packages that encompasses meals and drinks. 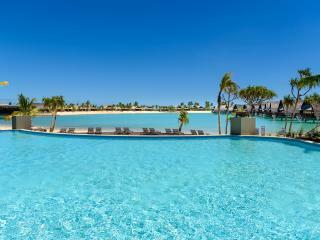 The Outrigger Fiji Beach Resort is set amongst an enchanting garden of blossoms, walking paths and ocean views. The resort offers 252 tropically furnished hotel rooms and bures in a style reminiscent of a traditional Fijian village. Huge freshwater swimming pool and full children's activities program are available. Great standard and good value accommodation, holiday resort for couples and families alike. Robinson Crusoe Island Resort is located a 40 minute drive from Nadi and then a 30 minute river cruise, followed by a short trip accross the lagoon to the island. Accommodation options vary from stand alone bures to dormitory style accommodation for the more budget conscious traveller. Enjoy the Island Dance Shows with some of Fiji's best Fire and Knife dancers. 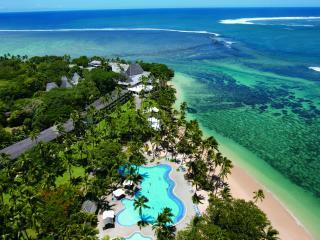 Robinson Crusoe Island Resort is great for families and couples wanting to enjoy a traditional Fiji experience. 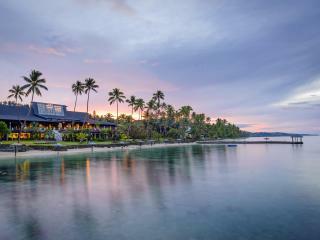 Shangri-La's Fijian Resort is located on the private 109 acre island of Yanuca, a 1 hour drive from Nadi Airport. Surrounded by white sandy beaches, emerald waters and colourful coral reefs. The resort offers a wide variety of facilities and guests will enjoy local styles blended with modern architecture. 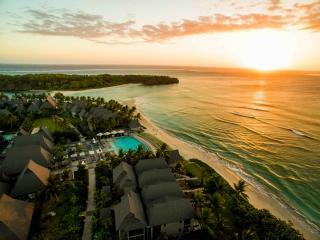 The Shangri-La Fijian Resort is Fiji's most popular and complete holiday resort. 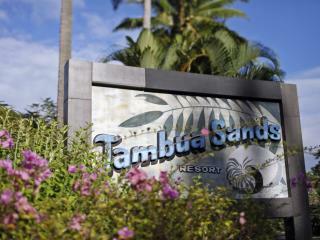 Tambua Sands Beach Resort is just under an hour and a half drive from Nadi International Airport. This Fiji accommodation is set on 17 acres of tropical gardens and coconut trees with 25 bures that over look the ocean and gardens. Tambua Sands is perfect for a relaxing and quiet Coral Coast holiday in Fiji, the onsite facilities include a swimming pool, restaurant & bar, tour desk and a boutique. The Warwick Fiji is located on the sun swept beaches of the Coral Coast, midway between Nadi International Airport and Suva. Each of the well appointed 247 rooms and deluxe suites feature a private balcony with sweeping Ocean or Mountain views. This five star Fiji accommodation is a popular resort for couples and families with a great range of facilities for both adults and children. 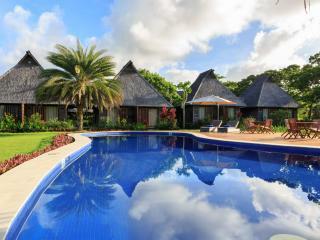 Yatule Resort and Spa, is a lovely boutique resort located on the shores of Natadola Beach. This accommodation option is the perfect choice for all travellers, including great onsite facilities, a great signature restaurant and direct access to the beautiful beach.